The most delicious healthy Avocado Chicken Salad of all times! 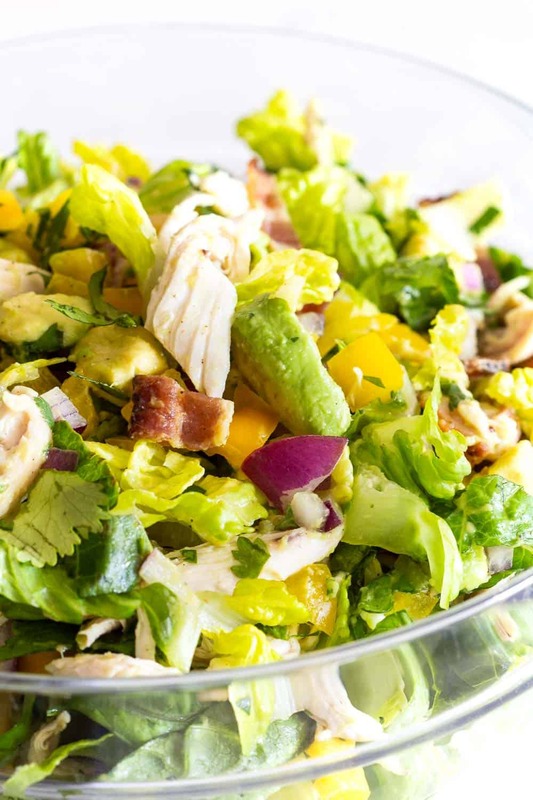 Romaine lettuce, chicken and avocado tossed with a simple olive oil lemon dressing! Making dinner has never been easier! Sometimes the simplest recipes are the very best. All healthy clean ingredients thrown together to make a complete and balanced meal. I could love this chicken avocado salad any more. The bacon in this recipe is optional but surely recommended. It gives it that little extra special flavor and texture. Plus, you bake it in the oven together with the chicken, easy peasy. Does Avocado Chicken Salad Turn Brown? The biggest question of all times. 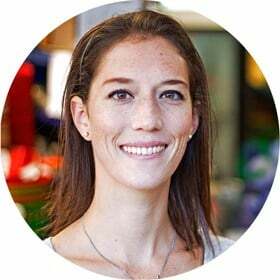 Does the avocado in a chicken avocado salad turn brown? Well after a while it obviously does. So the question isn’t really if it turns brown but rather when it turns brown and how to extend the avocado’s life. The trick is to drizzle the avocado with oil and lemon as quickly as possible. Cut it, add it to the salad and start coating it in oil and lemon as soon as possible. This way you can prepare the salad a good 20-30 minutes ahead of time. 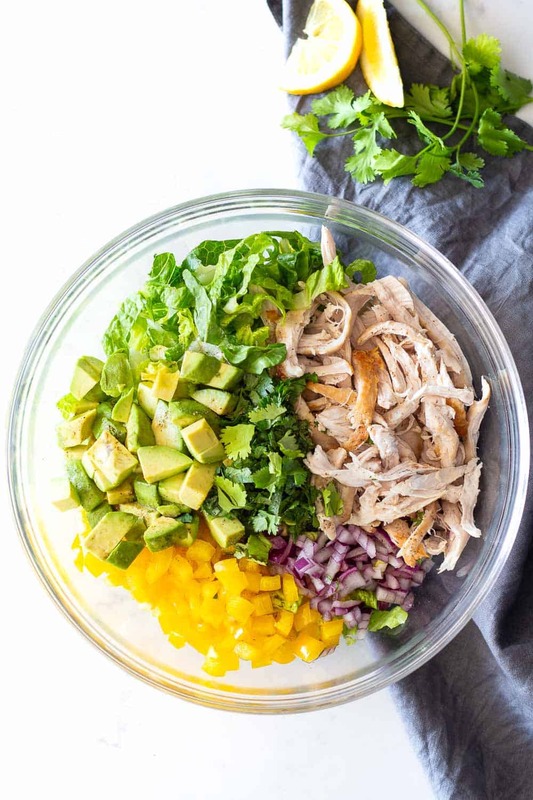 Alternatively, if you want to meal prep this chicken and avocado salad, you’re going to want to use a tall jar and add lemon, olive oil, salt and pepper to the bottom of the jar and then the avocado right away and coat it real well in the dressing. Also, make sure you use an air-tight sealable container. The more air, the browner the avocado gets. This way you can keep avocado without browning for about 12 hours. 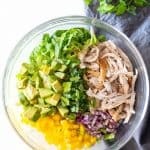 To finish off the meal prep version of this avocado chicken salad, add chicken on top of the avocado, and then the other ingredients that are better stored as dry as possible, like herbs and lettuce. Keep those far from the dressing and don’t mix. Just layer and make sure the jar is standing upright all the time. 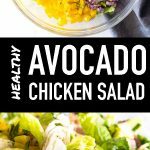 Is Chicken Avocado Salad healthy? Well, it all depends on how you prepare it. Some recipes call for just chicken and avocado and maybe a bit of onion and while I still believe it’s healthy, it lacks vegetables in my opinion. I like adding lettuce and bell pepper to my avocado chicken salad to make it even healthier and also fresher and crunchier. The avocados provides healthy fats, the chicken plenty of protein and the veggies round off the whole recipe. I definitely call this a healthy recipe. Preheat oven to 450F with the rack in the lower third of the oven. Add chicken breast to a baking sheet and drizzle with a little avocado oil and season with sea salt and pepper. Bake in the oven for approximately 15 minutes or until it reaches 165F. Place bacon on a different baking sheet with plenty of space in between each strip and add to the hot oven for 5-10 minutes depending on thickness until nice and crispy. Then remove and place on a paper towel lined plate to absorb the excess grease. Cut romaine lettuce into stripes, rinse and spin dry, then add to a large bowl. Wash, deseed and dice bell pepper. Peel, destone and cube avocado. Wash, spin dry and chop cilantro. Add everything to bowl. Shred chicken and add to bowl. Drizzle everything with a little olive oil (about 1 Tbsp), the juice of one lemon, and season with sea salt and pepper. Toss salad to cover everything well in the dressing. Add chopped crispy bacon last and give it one quick last toss. Serve. 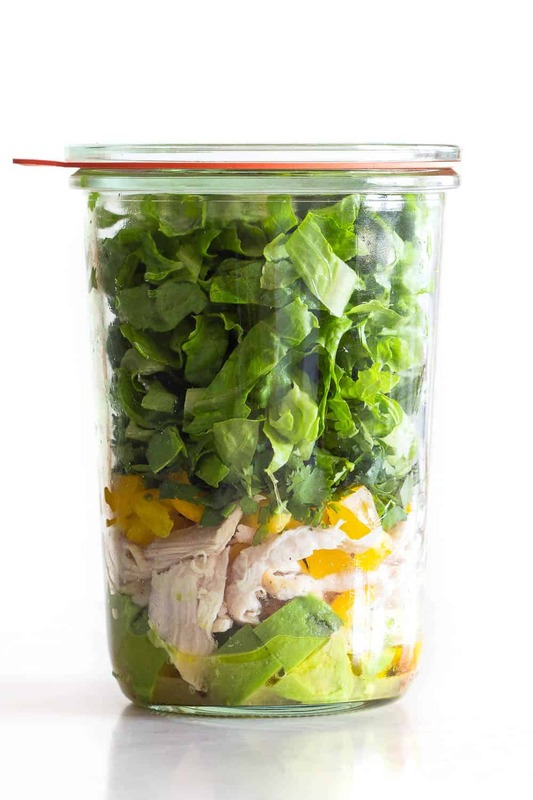 Meal prep version: Add olive oil, lemon juice, sea salt and pepper to a tall jar first, then add avocado and coat well in dressing, then layer chicken, bell pepper, cilantro, romaine lettuce into the jar and lastly top with bacon. Seal well and store in the refrigerator for up to 12 hours. Me and my husband recently started eating healthy as good example to our children. I came across your website by chance and we have been trying out several of your recipes. This salad was a huge hit! My husband hates eating salads (he calls them “rabbit food”) and he had to bowls of it! Even my 6 year old daughter loved it. Thank you for sharing your recipes with us and helping us live healthier, happy lives. I couldn’t love this comment any more Elizabeth! Thank you so much for taking the time to comment such wonderful words. I am so happy for you and your family. THIS is the reason I started my blog. THIS is the reason I will continue forever.